It’s getting really hard to find $500,000 shells around Mount Morris Park. I have a couple of clients who would love one (even a more expensive one) but the shells are getting bought up quickly and the few remaining aren’t for sale (or have huge complicating factors). Because it straddles the line between Central Harlem and East Harlem it’s a bit hard to describe the neighborhood – is it East Harlem or Central Harlem? Apparently some people call the area “High Five”. Think what you want of the label, but it’s clearly a distinct little neighborhood that needs a proper name. To me the boundaries of the neighborhood are Lenox Avenue to the west (but not including Lenox), probably Madison to the East (both sides), 126th to the south, and 130th to the North. The north and east boundaries are a little fuzzy though… To the east there are a few blocks between Madison and Park that might fall into High Five (since they’re generally consistent with the High Five aesthetic, and don’t fall into any other neighborhood). And to the north 130th is Astor Row which is a distinct area – it’s possibly part of High Five but also a distinct area of its own. By the time you get to 131 the blocks become dominated by apartment buildings – there are a few townhouses, but the core of the High Five character is lacking. In the past year two SROs (class C5 buildings) sold in High Five… 1990 Madison was the most recent (4/8/11). We went through it twice when we were looking for a place – it took a long time to sell. It’s a big, wonderful ark of a house (see pic on right) that was in habitable but rough condition. It had high taxes, no certificate of no harassment and there was trouble with drug addicts in the house next door (which has since been resolved). It sold for $525K which works out to be $97/sq. ft. The other SRO that sold was 66 East 127 (see pic of red brick building to the right). It sold for $300K back in February which works out to be $83/sq. ft. It’s on the other side of Madison, across the street from a large school, outside of what I’d consider to be the core of High Five. I can’t find any evidence it was up for sale. There was a foreclosure AND a tax lien the year before and then what seems to be a pretty quiet sale this year. Still, it’s price per square foot is inline with the price paid for 1990 Madison, though this might be some sort of inside deal and not reflect market price. It is vacant, and the new owners apparently want to flip it (according to one of the guys on the street). Even at the higher end – 8 West 127 (5 family) sold a month ago for $1.6M (see pic on right – the 5 story place with no cornice), which may seem like a good price but it’s got 7125 sq. ft. (19 x 75 x 5 story), so the price per square foot was just $225/sq. ft. – and that’s fully renovated – they even added a floor during the renovation. I pulled a lot of other comps and all tell pretty much the same story. Even the luxury condo on 127 just off Lenox is only selling for $395/sq. ft. and condos typically sell for more than townhouses (on a $$/sq. ft. basis). So I view $400/sq. ft. as the ceiling in High Five, though I could see one of the fabulous ones on 5th Avenue selling for more. 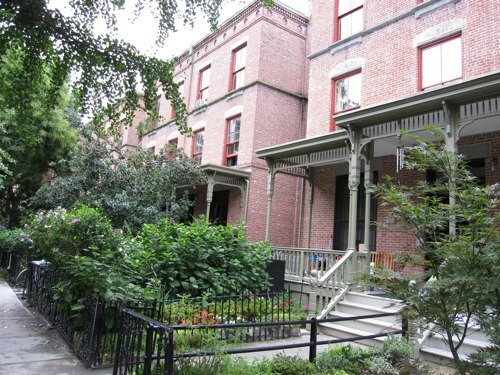 The highest townhouse comp I could find was 2107 5th Ave (4 family, renovated – see pic of light colored townhouse to the right) which went for $1.15M (roughly $295/sq. ft. – it has an extension, so actual square footage is a bit fuzzy). A client of mine went through it and said some parts of the renovation seem really well done, other parts feel cheaply done. His guess was that the owners started a high end renovation and then ran out of money mid-way through at which point they started cutting corners. 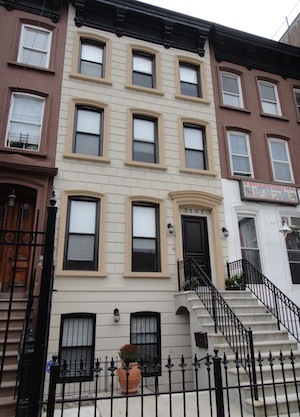 11 E 127 (3 family, fully renovated) went for slightly more – $1.175M, but it’s price per sq. ft. was lower @ $268/sq. ft. There were no sales of one and two family homes in High Five in the past year. (Well, there was one but it appears to be one owner buying out another owner – so it’s not a proper comp.) One and two family homes sell for more than 3 and 4 family homes, so it’s completely possible something will sell in the $400/sq. ft. range – it just hasn’t happened recently. The comps all make sense… Renovated places are selling for $150-200/sq. ft. more than shells and renovating a shell costs about $150-200+/sq. ft. depending on the condition of the shell. The neighborhood isn’t as established as places like Mount Morris Park, but with Red Rooster opening up at 126 & Lenox, and a nice grocery store going in at 129 & Lenox, and Wild Olive on 125 just east of Lenox – things are picking up. Personally I feel as though it’s a great long-term place to invest if you buy on the right block. But prices are likely to be more volatile than they would be in more established neighborhoods – so buyers need to be careful about when they buy and sell. I should also mention the people in High Five are incredibly friendly. A friend/client of mine was sitting on a stoop over at Madison between 129 & 130 a week or so ago when a manhole blew directly in front of him. The fire department and ConEd were called and all the neighbors came out onto the street. He and I spent nearly 2 hours with them and I have to say everyone was warm, welcoming and pretty great. I’m sure your experience will vary block to block, but there are some great places to live in High Five. 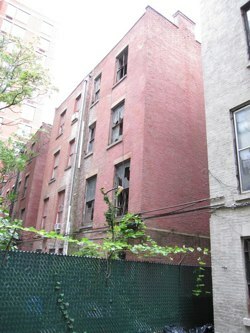 I’m baffled… 116 West 131 sold a little over a month ago (7/20/11) and it sold for $1,000,000. I have no clue who the buyer’s real estate agent and lawyer were, but both of them should have their licenses revoked (IMHO). If they had negotiated a price one cent less it would have saved the buyer $10,000. How can two real estate professionals make a mistake like that? Seriously, I don’t get it. The reason why one cent makes a $10,000 difference is because New York City has a 1% “mansion tax” on properties that sell for $1M or more. So if the sales price had been $999,999.99 the buyer wouldn’t have had to pay the mansion tax, but add a penny and they have to pay $10,000 in tax. The sellers originally asked $1.495M back in May of 2009. 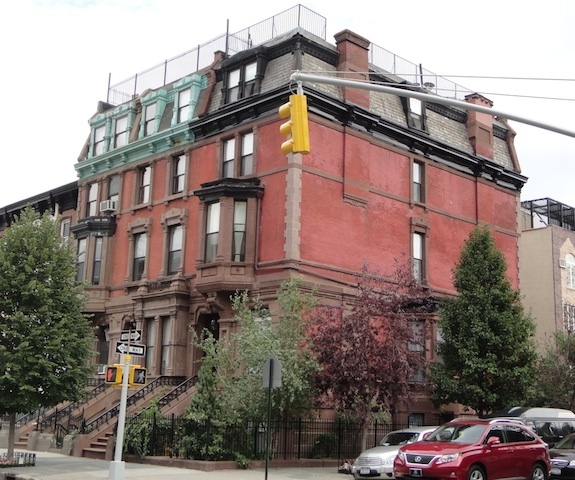 Finally this year they dropped the price to $1.195M and it sold – but even then they had to come down nearly $200,000 – but honestly that’s pretty standard with Harlem townhouses – the asking prices are usually way over where they sell. The building is 17′ x 48′ x 4 stories (though the lot is 16.67′ wide) so it has roughly 3,200 sq. ft. That means the cost was about $312/sq. ft. The building is a legal 3 family that was renovated in 2003 and got a new boiler in 2008. Overall, it seems to be in good condition. I’m guessing there is a 2 or 3 bedroom duplex over two 1 bedroom (or studio) floor-thru apartments – at least that’s the configuration that would make the most sense. Then again with kitchen configurations like the one in the picture above, there’s a good chance they did a less efficient layout. Taxes on the property are higher than average, but not outrageous – $5,517 this year and projected to go to $5,755 next year. It’s a 5 minute walk to the 2/3 at 135th Street. A/B/C/D trains are a fairly long walk – 11 minutes – much of which involves walking past the St. Nicholas Houses. Besides the lesson of never buying a property for exactly $1M, this sale shows that there are affordable properties out there that don’t require renovation. If your funds are limited now, but you want a property that you can improve later – a property like this is perfect. You live with rental grade details in the short term and when you have the funds you renovate and make things nicer. Harlem townhouses are a very strange market right now and figuring out a proper bidding strategy can be tricky to say the least. I thought I’d step through our thinking on one place in particular where our bid was just rejected to bring out some of the issues. 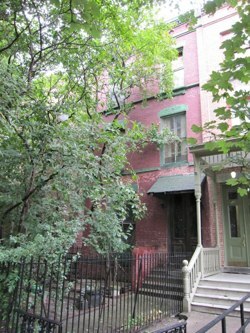 The townhouse we were bidding on was 54 West 130th Street which is one of 28 townhouses known as Astor Row in Central Harlem. There’s a good Wikipedia article on Astor Row, and the New York Times did an article on it recently as well. Astor Row townhouses are definitely not typical Harlem townhouses. They are brick with wooden porches and are generally narrower than their lots so they appear to be in pairs. Even though there are locks on all the bedroom doors (hinting it’s been used as a rooming house at some point), it appears otherwise to be an intact single family home, which is quite rare. There are lots of original details and they’re in pretty good shape for a 126 year old house. It appears to be in great shape overall. It has a unique layout with three large bedrooms per floor – so you get the space of a 5 story townhouse without the extra flight of stairs. It’s rare to see things in that condition these days. You see shells, and you see things where the details have been ripped out, but that particular combination isn’t something you see very often so it’s hard to put a price on it. When you look at the front you think it’s just a run down eyesore. It’s not boarded up and we think we remember seeing someone go in the first time we were around there. But when we saw the back of the building we realized it’s essentially a shell that’s getting rain into it’s interior through all the broken windows. Given the condition that’s evident in the rear, it needs to be boarded up. Either the person in it is living in squalor or it’s being used for drug activity. In either case it would be too easy for it to catch fire and spread to the buildings next door, so living next to it is a scary prospect. And it’s not just the next door neighbor…. The two at the end of the block are run down and owned by a Pentecostal church which is taking their sweet time renovating them. Further down the block there are a few others that are run down SROs and/or shells. Directly across the street there are a couple that are shell-like. One seems to have been gutted and then had all work stop. There are a couple other run down SROs on the other side of the block. The back yard is small (since so much room is given to the front yard) and there are rather rough rental buildings directly behind the townhouse. This is not like Hamilton Terrace where you have people on Convent Avenue looking at you. Go take a look at who’s hanging out in front of those buildings and you may not be so comfortable with them seeing everything you do in your back yard. 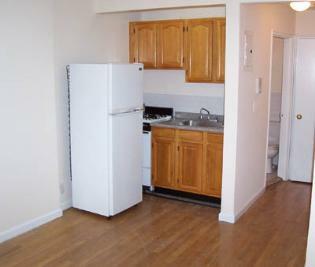 All in all you can’t use prime locations as comps for this townhouse. No matter who says it (including the NY Times), there are definitely more than “a couple” problem buildings on the block. While pretty much everything appears to be in working order, when you look closely you see a different story and realize that it needs all of the plumbing and electrical replaced. There are maybe two outlets per room. Most rooms don’t even have light switches. And looking at the electrical panel I’d guess it has maybe 100 amps of power going into the house. I think we have 200 amps in our apartment. 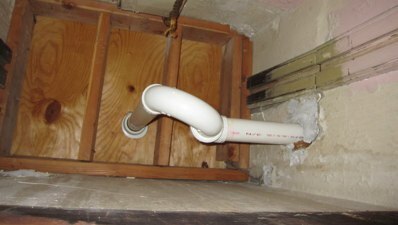 As far as the plumbing – it’s not up to code – it’s been done with PVC which is illegal in NYC. Given that plumbers can probably lose their license for using PVC I doubt the a licensed plumber did the work. Now think about what it will take to replace all the plumbing and all the electrical in a house where you want to preserve the original details. The work is best described as “surgical”. If it were a gut renovation it would be so much easier, but this has to be done by highly skilled workmen and will wind up being quite expensive. 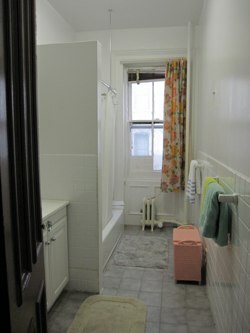 Given that all the plumbing has to be redone and the bathrooms are out of date (at best) that means all new bathrooms. Likewise the kitchens (there are two – the main one in the basement and a kitchenette on the top floor) both need complete overhauls. So you’re looking at 3 new bathrooms and two new kitchens – none of which come cheap. Add to that all new windows if not immediately, then pretty soon. 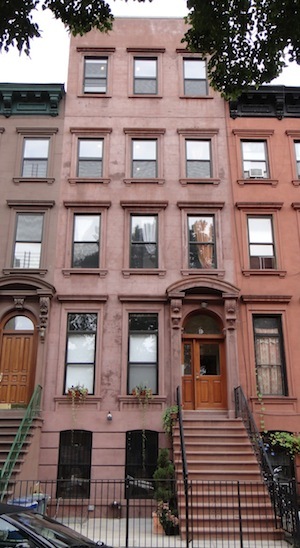 The windows on the front can’t be done cheaply – they have to be approved by the Landmarks Commission. The one in the living room is nearly 5 feet wide and 7 feet tall – there’s no cheap way do a window like that and get it past Landmarks. By the time you’ve finished work on that house you will have spent about the same as a low-end gut renovation. You’ll have a great place (except for the neighbor), but you’ve got to factor all those costs into your bid. 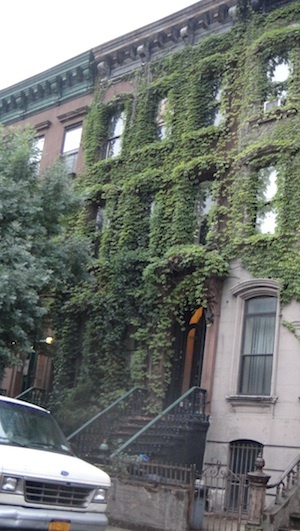 So how do you bid on a place like the Astor Row townhouse? 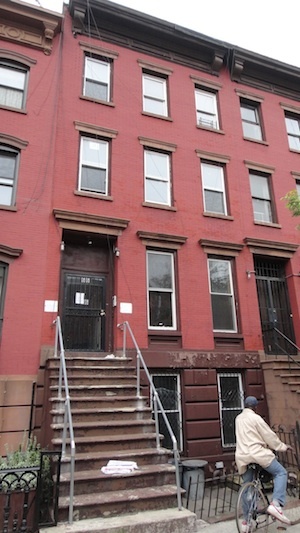 First, let’s look at the comps… There aren’t any perfect comps for this townhouse. There aren’t that many sales and none of what is selling is in a similar condition, in a similar location. So all you can look at is a range and then figure out where it falls in that range. At the low end you have shells (or ones that are essentially shells). 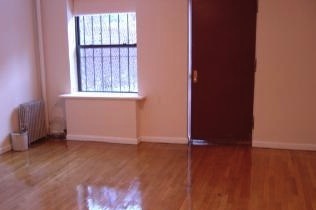 6 West 128th Street (two blocks down) sold for $144/sq. ft. on 7/22/09 which is 25% below what it sold for 5 months earlier. Also close by is 46 East 126th Street which sold for $98/sq. 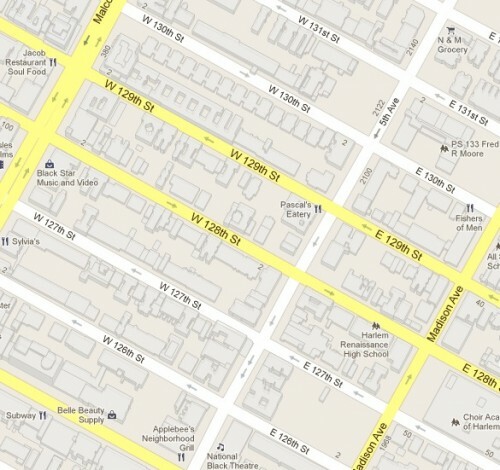 ft. on May 14th, but that one is affected by the rezoning on 125th Street. There are a few other comps but the ones in the low end average around $120/sq. ft. and never really get much above $145/sq. ft.
At the high end you have renovated ones that literally need no work and are in mint condition. 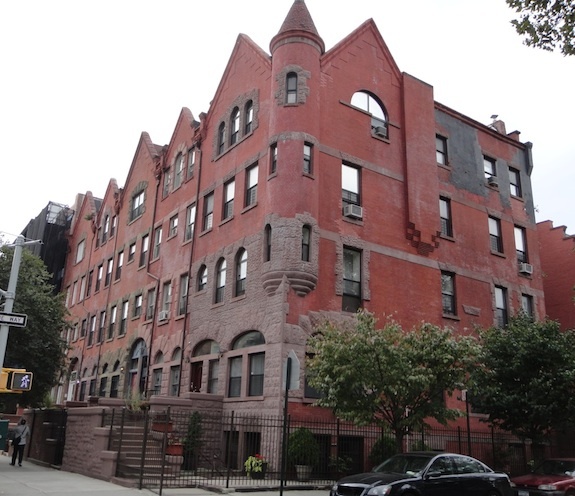 The best comps there are 63 West 127th Street which sold for $214/sq. 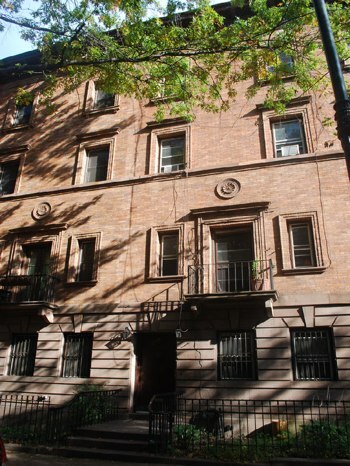 ft. on August 17th, and 133 West 131st Street which sold for $284/sq. ft. on June 8th. I would say mint condition townhouses in that area average around $250/sq. ft. If after renovations you’ve spent much more than those, then you’ve over invested. 54 West 130th has 3,525 square feet (officially, not including the English basement – there is no cellar, so much of the basement is mechanical). So, if it were a shell it would sell for around $425K. If it were in mint condition it would sell for between $875K and $1M. 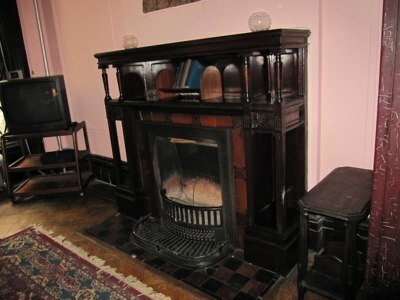 It’s hardly in mint condition and needs at least $350K in renovations – probably more like $400K. If you start with the high end of the mint comps and subtract the minimum you’d spend on renovations you come to $650,000. That’s actually what we bid, but it got rejected because “there was a substantially higher offer”. But looking at it that way is a recipe for overspending since renovations will probably cost more and the market might fall. But we loved the place and were willing to spend more than the comps warranted to get it. Honestly, I think the person who put in the “much higher offer” is insane. We’d never go “much higher” on that place – not with those neighbors and in that condition. $650K is also exactly half way between $425K and $875K (the low and the high), and the house is somewhere between those two conceptually as well – definitely not a shell, and definitely not mint. On a price per square foot basis we bid $184/sq. ft. and it needs about $100/sq. ft. in renovations. So our final investment would have been in the range of $285/sq. ft. – actually higher since $650K was just our initial offer and we were prepared to go up. There’s just not much selling around $300/sq. ft. so it would have been an iffy investment especially if real estate values continue to go down and even if they stay flat. The one we know well. Needs work, but very much livable. Recently renovated. Appears to be in great shape. For being the high end of the market, that’s not all that impressive. Most of those are just over $1M and they averaged $261/sq. ft. Subtract $100/sq. ft. for the renovations needed to this townhouse and you have $160/sq. ft. or $564,000. My other rule of thumb is that townhouses should be going for 40% of their 2007 comps – that’s just how much the market has come down. 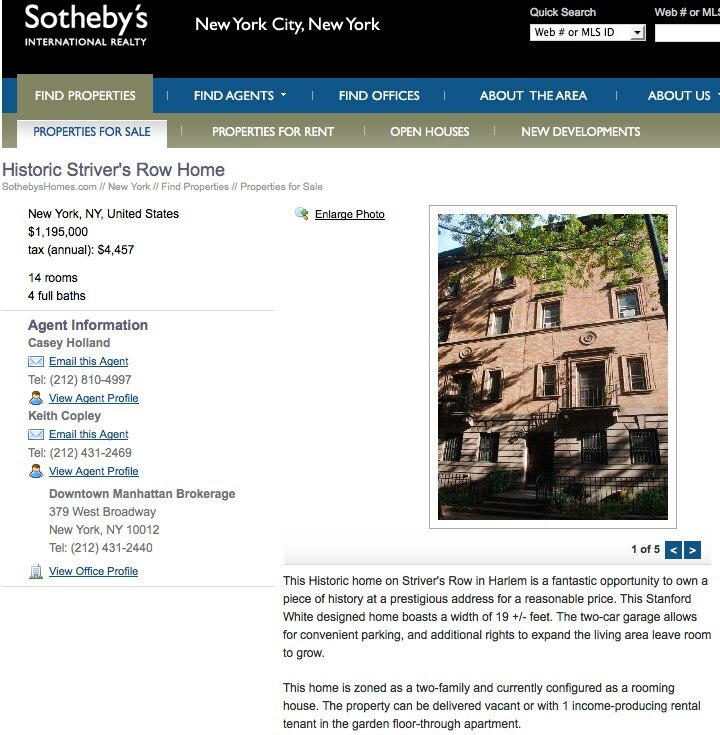 In 2007 a renovated Astor Row townhouse went for $1.875M and 40% of that number is $750K, but that was a renovated townhouse which only shows that one should use the lower end of the mint comps. We put in what we thought was a very competitive offer and it was rejected. It will be interesting to see how their other offer progresses and what it eventually sells for. There is an emotional factor to buying real estate and this property definitely elicits that. I just hope the new owner doesn’t regret what they paid for it after it’s all said and done. UPDATE: It’s now early March and the top of the market is clearly going up. I’d now guess this place will be worth $375/sq. ft. after about a $100/sq. 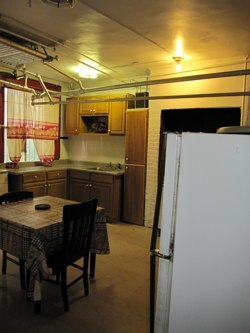 ft. renovation making it’s current value around $275/sq. ft. That means the value has gone up substantially – $950K is not unreasonable for this property now. You won’t be making money on it, but won’t lose your shirt either. Thing was, back when I initially wrote this the comps didn’t come close to supporting a number of $950K. After having our offer on this place rejected, we did finally buy a place and paid $122/sq. ft. for a total shell. After renovations we’ll have about $300/sq. ft. invested in our place and the current comps say it’ll be worth about $400/sq. ft. While I love the karma of the place on Astor Row, ultimately we were shopping for a deal and Astor Row wasn’t a deal… However, someone will be very happy living there and it looks like they won’t need to worry about having lost money on the deal, which means they’ll have no regrets.